The history of Scottish country dancing goes back at least three centuries. The intervening years have seen it flourish and decline, until it was rediscovered in the 1920s under the auspices of the (then) Scottish Country Dance Society chaired by Jean Milligan and Ysobel Stewart of Fasnacloich, and started to mushroom into its current, internationally popular form. The Complete System of English Country Dancing (1815). This claims to include “all the figures ever used in English country dancing” as well as “scientific instructions for the composing of country dances”. 370 pages. This is a huge file (9 MB, PDF). 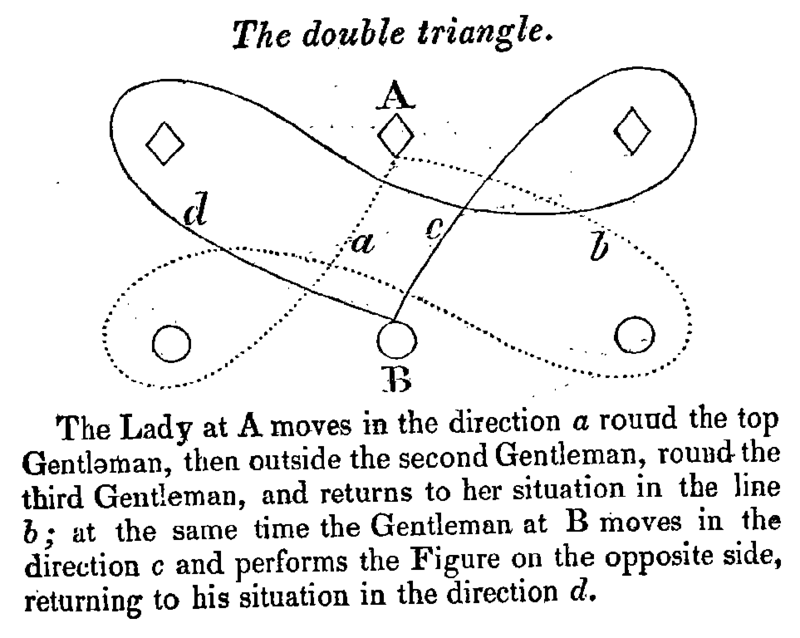 From that tome, the original description of double triangles (PNG graphics file). A Companion to the Ballroom (also known as “The Treasures of Terpsichore”) (1816). This is a collection of dances, some of which have been picked up and reconstructed (or, in some cases, mangled into something virtually unrecognisable) by the RSCDS. 201 pages, 2.2 MB, PDF. Rosemary Coupe sent in several interesting transcriptions of old dance books, which will eventually appear here too (I'm working on them now). An excerpt from Thomas Hardy's novel, Under the Greenwood Tree, which contains an interesting description of a country dance party (not “Scottish” … but even so). The full text is available from Project Gutenberg. Thanks to Malcolm Brown for pointing us to this. An exhaustive list of Scottish country dances with a military connection, compiled by Aad Boode. (This is not exactly to do with history but doesn't seem to fit elsewhere on the site, either.) This document was converted to PDF by me from Aad's original Microsoft Word file.